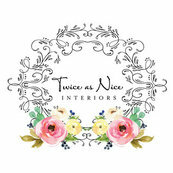 Mary and Nancy from Twice as Nice Interiors are extremely talented and have helped make our house into our dream home. It is incredible how they can put things together that we love but would have never been able to put together on our own. when we first went to their office, we were overwhelmed with all their selections. They have everything you can imagine. Mary and Nancy are definitely perfectionists and well worth the money! I can't believe this is my home! !